Never again will be heard from the hill-rims of the little Rockies the soul-thrilling voice of the white wolf, monarch of the wilds. No more will the flying gray wraith strike terror and death into the heart of the frightened herd and feed like an epicure on the choicest animal of the lot. All that he ever wanted from life, he took, won be his own master strategy. But his agile spirit is quelled, his reprehensible career brought to a close, stubborn muscles refuse to respond. Deaf to the call of the wilderness over which he reigned supreme for many years, for the while wolf is dead. Ten, fifteen, perhaps eighteen years, quite a span of life for a wolf under ordinary conditions it is said, and considering the manner in which he has been sought, the fact that the every man’s hand had been turned against him and he had been hunted from the ridge to plain, and back to mountain top with poisons, guns, traps, dogs and airplanes – that the lived as long as he did is nothing short of remarkable. He was killed by A.C. Close, who was accompanied by Earl Neill and their two dogs, following a chase of several hours which began near the Close cabin. The dogs had caught up with the killer and attacked him, and the outlaw turning ferociously upon the dogs and driving them back to the hunters who he failed to see until within 40 yards of them. Close fired from his position behind the tree, the shot taking effect in the front left cheek below the eye, “and that’s all there was to it” he said modestly. The value of the cattle he has killed over a period of 10 to 12 years to say nothing of deer and elk upon which he has fed, runs into the thousands of dollars. The heaviest losers being Charles R. Taylor and W.I. Hughes. Much interest has been aroused throughout Montana and other states over the dramatic career and ultimate death of the “White Killer” wolf that has ranged in the Highwood and Little Belt Mountains. Stories of the Wolf have been featured in the Montana Wildlife, Montana Farmer, Denver Post, Great Falls Tribune, Lewistown Democrat and many others. 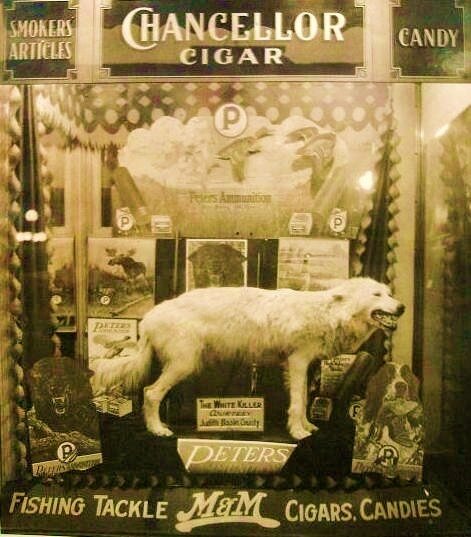 The Wolf was killed in April or May, 1930. Those who have seen the carcass of the killer described the wolf “as big as a full-grown calf.” It is true. The carcass is six feet in length, including the beautiful brush, nearly twenty inches long. The head is massive, with a full set of teeth, the four sharp, long fangs not badly broken. Gaunt and lank of body, he weighed 83 pounds. The carcass of the wolf has been mounted and rests in the Basin Trading Post next to the Prairie Collection. A fitting place for such a majestic animal. 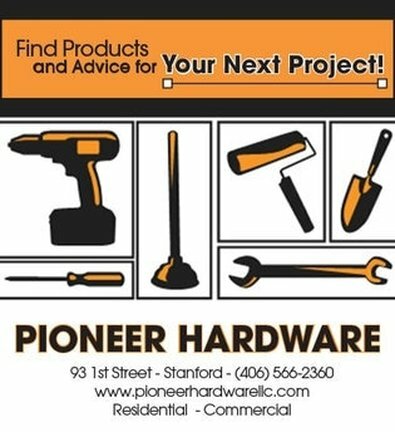 A special thank you to Don & Alverta Andersen of Stanford for donating some of the photos. 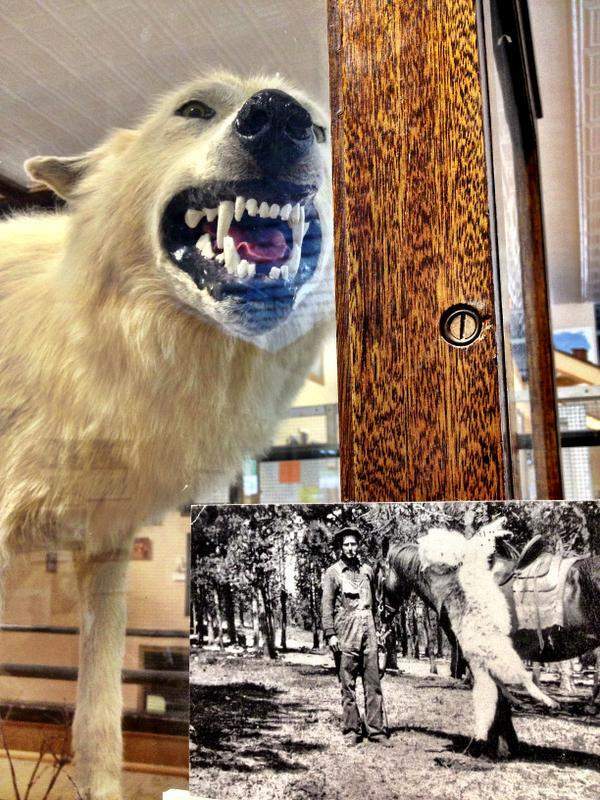 The bottom photo is of the actual "White Wolf" which is now located in Stanford at the Basin Trading Post; the top right photo is of Earl Neill - with their prized possession.